Sample the best of harvest season in Tuscany on the Via Francigena trails in Autumn. Choose to walk or cycle any of the rusty coloured trails lined with golden leaves to enjoy the very best of rural Italian life. At this time of year the climate is ideal. You will avoid the scorching temperatures of summertime while still enjoying the bright days of Autumn. Nature is showing off all of its style at this time of the year with leaves of gold, orange and red accentuating the beautiful Tuscany landscapes. So why should you get back to the past on the historic Via Francigena trail for the harvest season. There are several wine and food tastings throughout Tuscany at this time of the year. As you walk you will pass by old vineyards and terraced vines. In the evenings you can share a delicious Italian meal and sip on the local wines from some of the oldest vineyards in the region. From the walled city of Lucca to the historic centre of Siena, every stop along the way has unique towns open for exploration. Stroll through the winding streets, stop for a sip of the local wine at a small cafe, taste the nibbles that will be delight your taste buds before rising early to walk to your next destination. We all love searching for old antique, especially when we can get them on offer. At any antique fair you will find rare treasures and historic objects to admire. This is the perfect way to sample some historic while also enjoying traversing through the historic cityscapes. Check out the interesting prints, furniture and collections at the Lucca Antique market on the third weekend of each month. 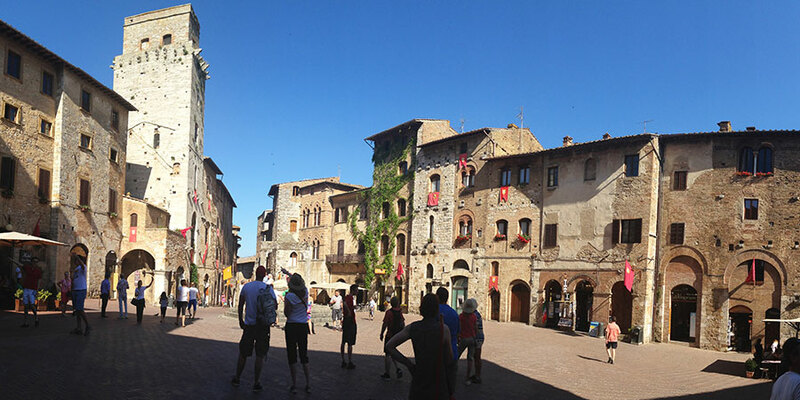 Another great fair takes place on the second weekend of each month in Montepulciano’s Piazza Grande with a great collection of antiques and crafts. Full bodied reds to complement your freshly baked oven cooked pizza and refreshing whites to wet your palate just in time for some gelato dessert. Italian cuisine is such an explosion of deliciousness. Enjoy carb packed meals, fresh, locally grown vegetables and sipping vintage wines at every stop along the way. Discover the hidden treasures of Tuscany when you stop to stay in San Miniato as you walk the Via Francigena from Lucca to Siena. The famous white truffle of the area is celebrated here every November with food lovers and chefs coming from every corner of the world. Did you know that the worlds largest white truffle, weighing 2,520 kg, was found here in 1954. 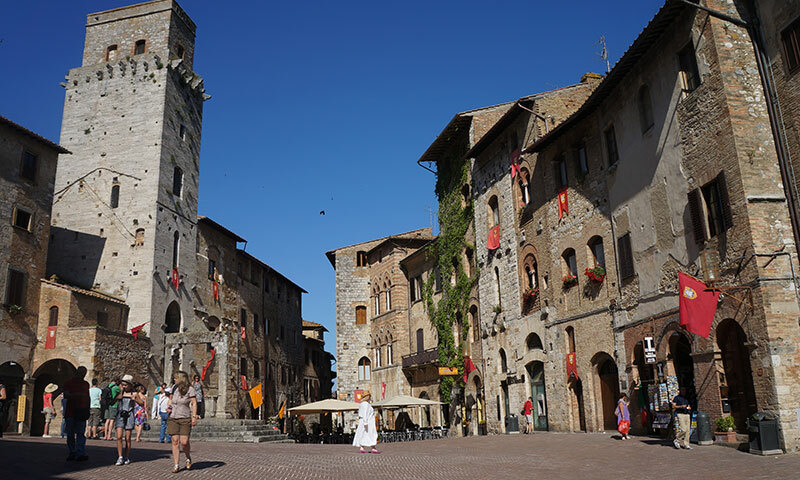 We know that you will enjoy discovering the romantic roads, charming villages and ancient Italian towns on the Tuscany section of the famous Via Francigena trail. If you want to learn more about the Via Francigena trails in Italy during harvest season please contact one of our travel team.